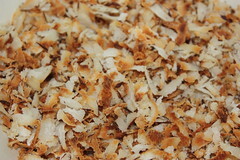 I am not 100% convinced that that's what the shredded, toasted coconut should look like. Turning from white to brown just went in a second, so I missed the point when I should have taken them out. But they still didn't taste bad, so I used them nevertheless. I opted for including some lime juice. The bio farmers at the market didn't have lime or lemons so I only used the juice from a store-bought, don't-use-the-zest-lime. I decided to take a bit more, to guarantee for the taste, because other bloggers wrote about a not very strong taste. And I decided to frost the cake with some white lime chocolate. I also opted for the rum, took a bit less sugar, and included a bit more of the shredded coconuts, not at least because my batter seemed to be very, very liquid. The recipe calls for 3/4 cups, and although I made only half the batter, I used the whole amount of coconut. 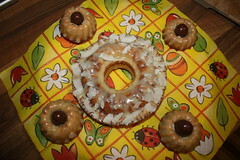 I made a small bundt and six minis. 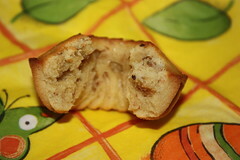 It would not have mattered to have a bit more batter, but it was ok like that, too. For the frosting/glazé I took a spanish organic white chocolate infused with lime and littlle sprinkles of red pepper (which I could spot in the chocolate but dissappeared somehow in the end-result). I spread some shredded coconut over the glazé, but had the feeling that it looks better without. I LOVE this cake! This is just my cup of tea. It wasn't dry at all. The subtile coconut taste was just perfect and matched perfectly with the very subtile lime flavour. Both taste weren't too dominant, but that's how it should be (according to my preferences). I love how the minis look like, I love the texture of the cake, I love the not-too-sweet-sweetness. I could do this again and again and again. 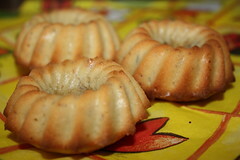 Find the recipe in Dorie Greenspan's book "Baking" on p. 194-195, or on Carmen's blog! looks amazing! Great job! I loved this - I bet it was incredible with lime! Ahhh what amazing looking cakes! Im glad you enjoyed the recipe. 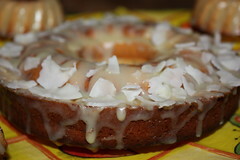 Your cakes look great, and I'm glad the toasted coconut worked out for you! I actually liked the coconut better when it was brown, as it was crisper. I loved this cake too, and it seems like so long since I made it that I want to make it again!! Thanks for the link and the kind words. 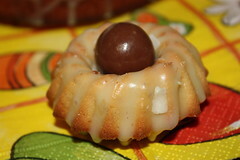 :) Sadly, I didn't have time to bake this week with the Easter holiday.